What is it and how to make Bone Broth? Have you heard of bone broth? Maybe you’ve heard it mentioned but aren’t quite sure what it is why it is so highly praised by many. Bone broth is simply a liquid obtained from boiling bones from chicken, turkey, pork or beef in water. The biggest difference between bone broth and regular stock is that bone broth is cooked a lot longer. The end result is a tasty liquid that’s delicious on its own, but also makes a wonderful and nutritious base for soups and stews. Speaking of nutrition, it’s one of the main reasons people make and consume bone broth regularly. Of course it’s also very tasty, but more on that in a minute. When you boil bones for a long period of time, you leach all sorts of nutrients, minerals and other things that are good for you like glucosamine and collagen. It’s also good for your immune system. Remember grandma making a big pot of chicken soup anytime someone would get sick? The same principal is at work here. Think of bone broth as a more concentrated version of Grandma’s healing soup. The broth may even help you sleep better at night. Sip a cup of the tasty liquid before bed. It’ll work better than the hot milk your mom used to bring you. To make bone broth you take bones like those from that leftover chicken or turkey carcass sitting the fridge for example. Cover it with plenty of water and simmer for several hours. How long you cook your broth is up to you. 12 hours gives you a very decent broth, but cooking it even longer makes it even more nutritious. If you’re using the bones from a roasted chicken, consider tossing them in a large crock pot and making your broth right in there. They can safely bubble away as you go about your day. You can drink the finished hot broth as is, season it up with your favorite herbs and spices, or use it to make a pot of soup or stew. The cooled broth can be stored in the fridge for about 4 days or in the freezer for up to a year. The next time you pick up a rotisserie chicken from the grocery store or roast that Thanksgiving turkey, don’t toss out the bones when you’re done. Use them to make a batch of delicious bone broth that’s good for you. Once you try it, you’ll be surprised just how easy it is to make and how truly wonderful it is. 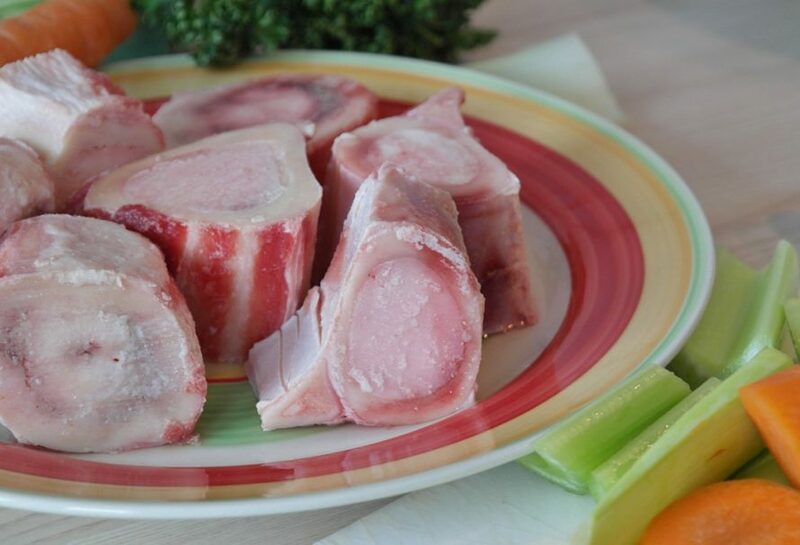 Bone broth is not only nutritious thanks to the extra marrow and gelatin in the bones as opposed to regular broth, but it is amazing for people on low-carb diets like Keto and Paleo. The benefits of bone broth are only present when it’s properly prepared with lots of protein. If it doesn’t have a significant level of protein, it’s not real bone broth. Bone broth is the liquid you get from boiling bones in water for several hours. It has a lot of nutritional value, is full of minerals and is said to help boost your immune system. It’s also very tasty and makes a wonderful base for all sorts of soups and stews. The easiest way to make your first batch of bone broth is to start with a cooked chicken. Roast it yourself or head to your local grocery store and pick up a rotisserie chicken. Pull the cooked meat of the chicken and serve it for dinner. Store any leftover meat in the fridge to use later on to make chicken and noodle or chicken and rice soup with the bone broth you’re about to make. Put everything that’s left – all the bones and any remaining bits and pieces of meat – into a large pot that has a lid. Fill it with plenty of cold water. The more water you add, the more broth you’ll get in the end. Don’t fill it all the way to the top or you risk the liquid bubbling over. Next, add a good splash of apple cider vinegar to the pot. This step is optional. If you don’t have the vinegar in your pantry don’t fret it. You can add a splash of red wine or white vinegar if you’d like. The vinegar helps get all the minerals out of the bones and into the broth. But again, don’t worry if you don’t have it. Your broth will be just as tasty and almost as good for you without it. Cover the pot with the lid and crank up the heat until everything comes to a full boil. Reduce the heat to a simmer. Cook your bone broth for a minimum of 12 hours. Although, if you can cook it for 48 to 72 hours, that is better. Of course you don’t want to simmer the broth while you’re out of the house or sleeping. Start the broth in the morning on a day when you know you’ll be home. Simmer it all day until you’re ready to go to bed. Turn off the burner for the night, but keep the broth sitting on the stove. In the morning, bring the liquid back to a boil and continue simmering. The broth will be tasty after a few hours of simmering but will get better with time. After it has cooked for 12 hours you can start to use it. Just replace the liquid you’re taking out with more water to keep stretch the broth. Pour some of the finished bone broth into a smaller pot, add the shredded chicken along with some rice or noodles and leftover veggies to make some soup. Or just drink the broth. It’s delicious. There’s been a lot of buzz online about bone broth the past few months. And for good reason. There are a lot of good reasons to make this amazing liquid. If you haven’t tried making your own yet, grab some leftover chicken bones and a pot and get to work. Your taste buds, wallet and your health will thank you. Let’s start with the obvious homemade broth, stock or bone broth tastes really good. If you haven’t tried making any of these, do yourself a favor and get in the kitchen now. Bone broth in particular has a deep rich flavor that you just won’t get out of a cartoon of chicken stock. Drink the broth on its own, or use it as the base for soups, stews and sauces. You can use bone broth in any recipe that calls for broth or stock. Or try simmering your rice or vegetables in the broth for added flavor and nutrition. Bone broth is made from the bones you’d toss in the trash otherwise and water. It doesn’t get a lot more frugal than that. For no more than the cost of a little power to boil the bones, you have something that’s just as tasty as or better than high-end stock you buy at the store. If you’re buying quality chicken, turkey or beef, you can make the most of every dollar you spend by utilizing every little bit including the bones. Then take it even further by making soups and stews with the broth. It’s a great way to make even little bits of meat and veggies go a long way. Let’s not forget about the health benefits of bone broth. There’s a reason grandma would put on a pot of homemade chicken soup when someone got sick. Bone broth is full of minerals including magnesium and calcium. The fat content in the broth helps our bodies absorb the various minerals. It’s also full of collagen and gelatin which are good for your skin, hair and joints. Add to that the immunity boosting properties of a good cup of broth and it’s no wonder this has been praised for centuries. There you have it. Bone broth is one of the tastiest and inexpensive health foods that you can make right in your own kitchen. Grab that chicken carcass leftover from last night’s dinner from the fridge, get out your large stock pot and get cooking. Previous article A Few Useful Workout Arrange For Starters?